The traditional English pub meal is something that everyone should try when they are in the UK. Some of these dishes are national favourites, and are filling and tasty. Bangers and mash is a dish of sausages served with mashed potatoes and gravy. Occasionally, fried onions are included. Sausage is a food type that was first seen in England during the Roman occupation. Beef Wellington is a piece of beef cooked in a pastry crust. This is a dish that developed in 1939, and became very popular nationally. This is usually served with potatoes and vegetables. Cottage pie (often called Shepherd’s Pie), is a dish of minced meat in gravy, often with onions and carrots, which is served with mashed potato on top. This is layered in a dish which is then put in the oven to help form a light crust on the top. This is a favourite in pubs all over the country. Fish and chips is a traditional meal all over the country, and not just in pubs. This is a white fish fillet served in batter. This is cooked by deep-frying it, and serving it with chips. It is thought to date back to around 1870. A full English breakfast is very popular in pubs all over the country. So much so, that they serve it all day long, and not just in the morning. This includes bacon, sausages, eggs (fried or scrambled), mushrooms, toast, tomatoes and baked beans. Most places also include a pot of tea! 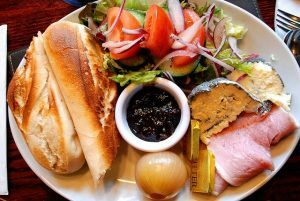 The Ploughman’s lunch is often seen as a type of salad these days, but when it was first developed it was just a cheese sandwich that included pickles and apple. There are now some variations on the Ploughman’s, so some might serve it with ham, while others will include lettuce, tomatoes and cucumber.